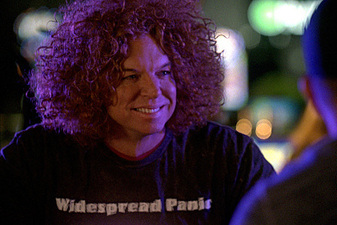 Carrot Top guest starred on "CSI"
After ten seasons of faithfully watching the flagship show of the mighty CSI franchise, I let the show fall of my regular viewing schedule this year. I watched the first two episodes of the season, but decided it wasn’t worth the time to keep up with anymore; I’d watch when I could, but wouldn’t make it appointment viewing. Last night, I caught my first episode since those first two, “Man Up,” and it pretty much just solidified by previous thinking about the show. I have a few other quick thoughts after the jump. The first few years of CSI pushed the crime procedural into new stylish and scientific realms, and seemed truly groundbreaking. The fact that CBS has remade its entire line-up to resemble this innovation takes away from the original’s merits, but it is still one of the most important – and at times, most entertaining – shows of the decade. CSI: Miami has turned into a parody itself, and I never really watched CSI: NY, but I still have fond memories of the original, and enjoy watching the occasional episode, even if I’m not tuning in week-to-week. Last night’s episode, “Man Up,” featured some of the best and worst of the CSI franchise. The primary case, about a dead prostitute whose death was staged before being carried out for real, was pretty good. It featured some good banter between what’s left of the original team and had several of the trademark puns we’ve grown to expect. But having the killer be the guy who always got picked on by his friends, who suddenly snapped and turned into a psycho murderer just because the prostitute called him stupid, was predictable and didn’t give us much except a seemingly out-of-character (for the little characterization he had up to that point) confession speech. The other case was pretty awful. Hodges brought his motorcycle into the lab to show Ray, and Ray proceeded to show off his knowledge of bikes by pointing out all the non-vintage elements. The two then found a thumb tip trapped in one of the parts, which led Hodges to “follow the evidence” to a junkyard, where the two owners had declined to report that a motorcycle and its rider had been trapped between two buses that had crashed. There was nothing special about this one, and it kept Langston on the sidelines acting smug, which is not his most appealing trait. The highlight of the episode was the ridiculous number of recognizable guest stars. Carrot Top (!?) was featured as a kidnapped celebrity, Amy Acker (Angel, Dollhouse) was the motorcyclist’s ex-girlfriend, Kevin Weisman (Alias) was the dead prostitute’s boyfriend, and Rich Sommer (Mad Men) was the killer in the main story line. Trevor Donovan from 90210 also popped up as Spartacus. “Man Up” wasn’t a horrible episode, but it was certainly mediocre, and didn’t make me want to start watching CSI every week again. The show does what it does well, but with so much other better TV out there, it won’t be making it back on my regular viewing schedule. This entry was posted in CSI. Bookmark the permalink.